One of the great advantages of overseas living is that you get to rub noses (sometimes quite literally) with folks from just about every nationality in this big wide world. In Jad's Kindergarten class of 16, no fewer than 10 different nationalities are represented! 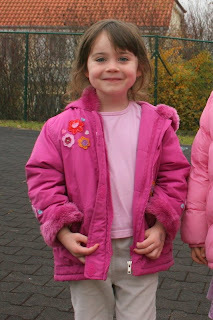 Last Friday was "International Day" at Jad's school. 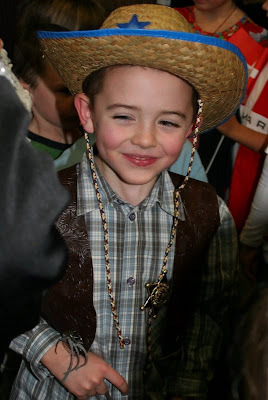 Being a red-blooded Oklahoman/Emirati/Omani/Zimababwean/Oregonian, there was no question as to what Jad would dress up as. A cowboy! What kid wouldn't? He even brought his stick horse "Silver" (as in "hi-ho, Silver - away!") along for the grand parade of nations. In addition to parading around in national dress, parents in Jad's class set up activity centers representing each continent - helping the kids make a craft or learn something new along the way. Erin helped with the Africa table - in honor of Jad's first home in Zimbabwe. This week, Jad heads off on a new adventure... his first experience as a Kindergartner in the America (technically, his "home country")! It's going to be quite a difference... most likely, there will be one or two nationalities represented, instead of ten. And as Jad pointed out, "everyone will speak English!" And... he'll get to ride in a yellow school bus! 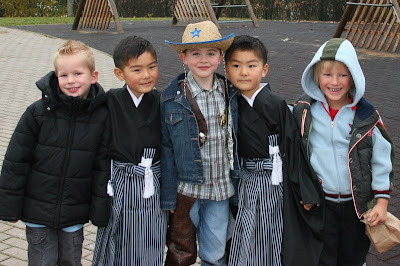 As a fellow Third Culture Kid, though, I can't wonder if he's not going to miss being a cowboy flanked by buddies in Kimonos!